Hair and fur of our beloved animals can often turn into a huge mess in our house. It will be literally everywhere. On your clothes, walls, dining table, upholstery, and furniture. Keeping your pets away for this one reason is not the right thing to do. Instead, we can start learning to deal with various methods which will be helpful in dealing with removal of cat hair from clothes. Some of the easiest methods to remove cat hair from clothes are by using moisture, using static attraction and gripping surfaces. Preventing the pet from losing too much will also help to one extent. Soak your palm in a bowl of water and start wiping the cat hair off the clothes in downward direction. 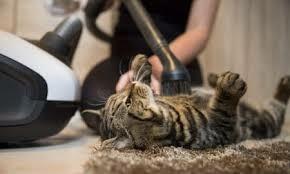 This method works as the cat hair will become wet and heavy when water is run over them. This makes the hair hard to stick as the static electricity is affected. Take a normal kitchen sponge and soak it in water for some time. Squeeze the water off the sponge and run the sponge against the clothes which had cat hair stuck to it. The fur will get stuck to the sponge which can be removed by hands as clusters. Gripping surfaces have the required surface area contour which will help in removing the cat hair from the clothes. All you need to do is to roll the gripping surface on the clothes. 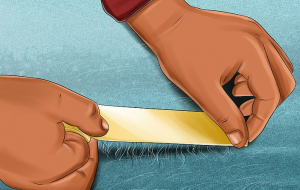 Wrap the sellotape to your hand with the sticky part facing outside and stick the tape on the area where the removal of cat hair is to be done. By using the electric attraction method we can not only remove the cat hair from our clothes but we can also remove from furniture, bed, dining table and etc. Use of latex glove: Wear a latex glove and rub your hands over the area where you want to remove the cat hair from your clothes. This method works with rubber gloves or cloth gardening gloves which has a rubber coating. Moistening the rubber coating will increase the efficiency of the removal of cat hair from clothes. Inflate a balloon and rub it across the clothes from which you want to remove the cat hair. 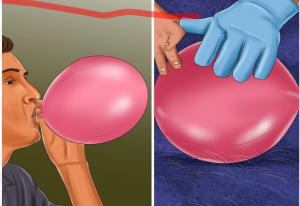 The change of the static charge on the surface of the balloon will attract the cat hair towards it when you rub the balloon across the clothes. Later you can collect the cat hair directly from the balloon in clumps form. This is a special kind of broom which is widely used to clean up the pet’s hair in households. This can be used for any kind of surface and object all you need to do is to dust off the cat hair from the clothes. The bristle used in this sort of brooms will attract the cat hair to jump from the clothes. Like cowboy style, use a pair of shoes which has a rubber sole, now drag your foot along the area which you want to clean. All the cat hair will be stuck to your shoe sole. After doing this process you can simply wash off your boots. The fabric softener which we use in our washing machines will also work for this task too. Spray the softener on the clothes before putting them in the washing machine. This will “prep” the clothes to release the cat hair stuck to them. Place your clothes in the place where you cats can’t reach. Make sure that you keep your clothes in the racks which will be closed after use. By doing this we can eliminate the contact between cat hair and your clothes. Be a cat or a dog, shredding of hair is common. If your pet sheds a lot, extra care must be taken in grooming standards so that they will maintain high hygiene. Next post Do House & Pet Sitters Need to Know How to Train Dogs?